The galaxy above is seen at a time when the Universe was 15% of its current age, only 2.4 billion years after Big Bang. The light has taken over twice the age of the Earth to reach us (11.4 billion years), detouring along the way around a large foreground galaxy that is comparatively close at 4 billion light-years away from our Solar System. The foreground galaxy is acting as a lens, warping SDP.81’s light and creating a near-perfect example of a phenomenon known as an Einstein Ring. For centuries cartographers were fond of depicting monsters along the edges of their maps. This past summer, researchers detected this monstrous galaxy near the edge of the charted Universe with unprecedented detail using the Atacama Large Millimeter/submillimeter Array (ALMA) with the assistance of a 'natural telescope' known as a gravitational lens. The team modeled the lensing effects and corrected for them to reveal the distribution of huge stellar cradles in the monstrous galaxy shown in the image above. As a bonus, the same model indicates, for the first time, the existence of a supermassive black hole at the center of the foreground galaxy. 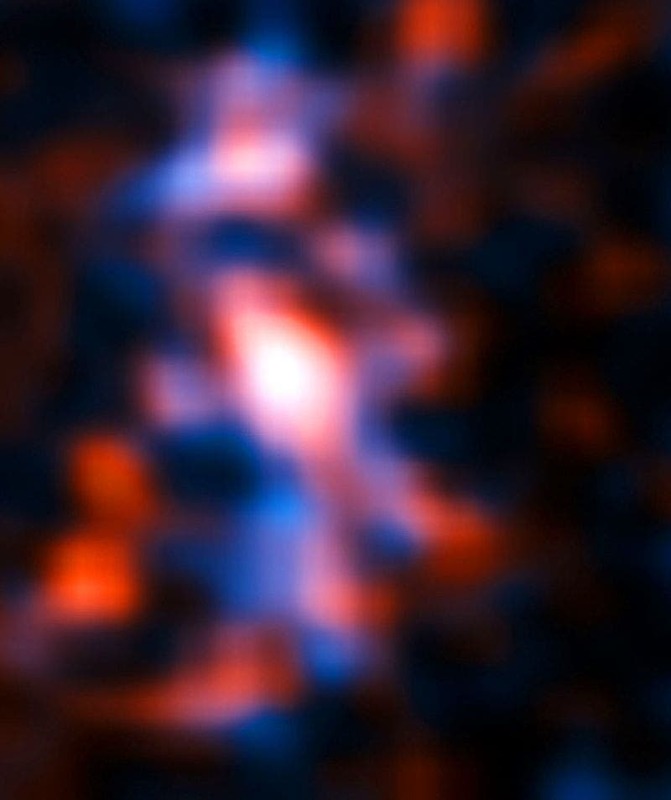 During its high resolution test observation campaign in October 2014, ALMA imaged galaxy SDP.81, located 11.7 billion light-years away from the Earth in the constellation Hydra. A gravitational lens created by a massive foreground galaxy 3.4 billion light-years from us acts as a natural telescope, magnifying the image of SDP.81. 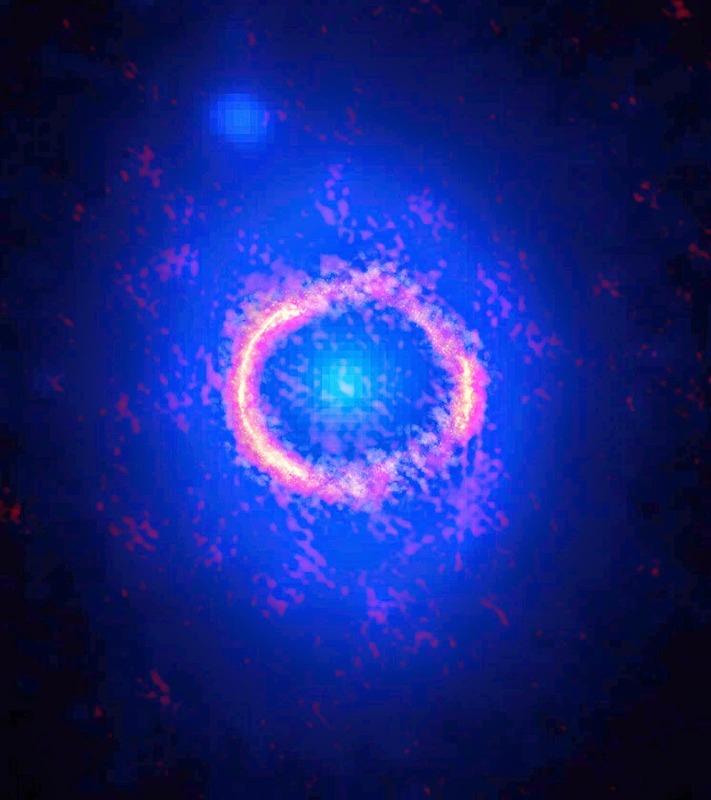 This composite image below shows SDP.81; the bright orange central region of the ring reveals the glowing dust in this distant galaxy; the surrounding lower-resolution portions of the ring trace the millimeter wavelength light emitted by carbon monoxide; the diffuse blue element at the center of the ring is from the intervening lensing galaxy. The image becomes brighter but smears into a ring shape, as can be seen in at the top of the page. This ultra-sharp image of the ring astounded astronomers around the globe, but it has been difficult to understand the details of its complicated structure. Yoichi Tamura and Masamune Oguri, assistant professors at the University of Tokyo, together with researchers at the National Astronomical Observatory of Japan (NAOJ), constructed the best model to date for the gravitational lens. Einstein's theory of General Relativity tells us that a massive object bends space and time. As shown in the image above, the light traveling through this curved space-time bends to follow the curve, thus the massive object works as a cosmic lens. In the rare cases that a distant galaxy, an intervening galaxy producing a gravitational lens, and the Earth line up perfectly, the image forms a circle of light known as an Einstein ring. These gravitational lenses make the distant objects look much larger and brighter, helping astronomers to study galaxies, black holes, and dark matter in the distant Universe.